We offer an entire range of dental services for our little ones. We understand their nature and take great care in a child-friendly specially designed pediatric suit. 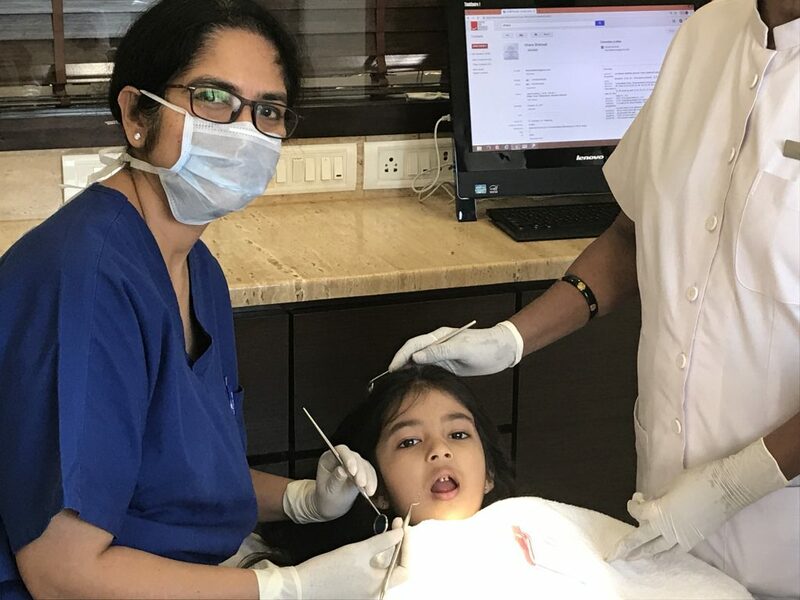 The staff is specially trained to take care of your precious ones.Dr.Ritu Shah looks after the pediatric Dentistry along with Dr.Sharad.Both are extremely fun to be with and are loved by all our little gems. The American Academy of Pediatrics and your paediatrician recommend you bring your child for their first dental visit by the age of one or six months after the eruption of their first tooth. Does my child need to take care of their teeth even if they are baby teeth and are going to fall out? How can my child’s thumb sucking habit affect their teeth? If your question isn’t here, feel free to ask us! We love parents who want to learn more about their children’s optimal dental health. We @ Dr.Ashish Shah & Associates like to engage the children in a “Tell, Show, Do” approach during the visit. This technique is very effective for this age group because it encourages the child to open up and become actively involved in the visit. At Dr.Ashish Shah & Associates, we understand children have different needs and comfort levels. We frequently recommend scheduling a separate cleaning appointment after the initial examination, so we make dental hygiene and dentist visits a regular and essential part of their lives. With years of experience and wisdom as parents, we hold true to our mantra: prevention. A pediatric dentist always needs to be thinking and planning for the future. With adults, there is no orofacial growth and development to consider, but with children, every visit is unique in that it will set the stage for your child’s future development. Diet counselling: We converse with parents regarding the child’s diet. Does the child eat between meals? Do they lean towards eating sugary carbohydrates or protein? We are able to determine their risk level and recommend alternatives as part of our prevention program. Although emergencies cannot be planned, one can prepare for them. We try to accommodate all emergencies on the same day. If it is outside of normal office hours and your child has an emergency tooth issue, don’t hesitate to call Ashish Shah & Associates. You will be connected to an on-call dentist, who can provide recommendations and see your child immediately if needed.